Q: What do you like about MAX and what do you feel sets MAX apart from your other competitors? 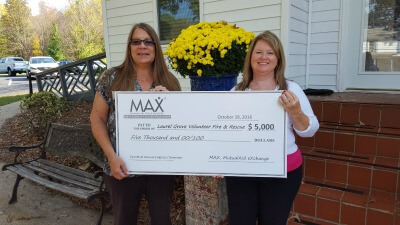 A: I love that MAX gives back to the community through their Mutual Aid Ministries (“MAM”) program including volunteer organizations like fire departments, to churches and also individual families. MAX has good products and competitive rates, as well as, great customer service. Anytime I have a question I can always reach my sales representative or someone in customer service. Although I have never had to file a claim, I anticipate the experience will be as great as the service I have always received. Q: Why would you choose MAX over your competitor? A: It’s pretty simple: MAX is a company that truly stands behind their customers, strives to offer competitive products and I love what they stand for. Q: In what ways does your agency support your community? A: Several of our agents are volunteers in our community and they, as well as, the agency, make contributions to community organization such as the cancer society, volunteer fire department and other organizations. Q: What do you feel are the advantages of an Independent Agent vs. Exclusive Agent? A: An independent agency has the ability to offer several options based on the needs of each customer. They also have the capability of quoting their policy with 10-12 different companies, so the customer is guaranteed to get the best rate. An independent agent vs. a direct marketing company has huge benefits as well. In addition to the options and best rates, you will always be able to speak face to face with an agent….an independent agent is like family, they are always there when you need them.